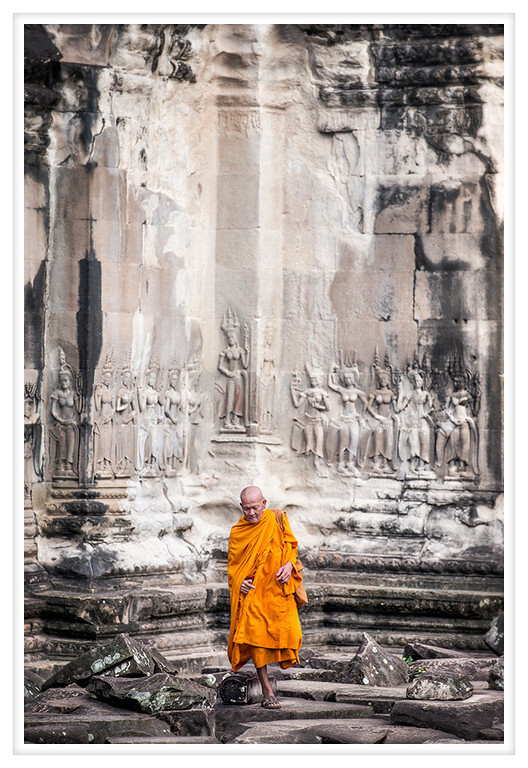 Angkor Wat is not just a place that foreign tourists visit, monks from all over Cambodia come too to absorb the majesty. This monk and his companions traveled down from near the Thai border to see the temples at Angkor. He was accompanied by a younger monk with greater seniority on his trip. It sounded like he came to the monastery late in life; it may be that he is a widower who has looked to a retirement of a religious nature. I took a series of candid shots but he and his companion later posed for us. It was very kind of them to indulge us but they were so wooden and unnatural looking that I much prefer these. The carvings on the walls depict Apsara, celestial dancers who inhabit clouds and water. When clustered together the Apsara become divine guardians and here they serve to protect the mountain temple that is Angkor Wat.